AUDI A3 1.6 FSI Attraction FÉLBŐR+DIG.KLÍMA+ALUFELNI!!! AUDI A4 Avant 1.9 PD TDI BŐR+TEMPOMAT+ALUFELNI!! AUDI A4 Avant 2.0 PD TDI DPF S-Line FÉLBŐR+TEMPOMAT!! AUDI A4 Avant 2.0 PD TDI XENON+VEZETETT SZERVIZKÖNYV!! BMW 530xd Touring (Automata) M-PACKETT! FULL EXTRA!!! CITROEN C4 1.6 VTi Collection TEMPOMAT+2 ZÓNÁS DIG.KLÍMA! DACIA SANDERO 1.2 Ambiance KLÍMÁS!!! FORD FOCUS 1.6 TDCi Trend 2 ZÓNÁS DIG.KLÍMA+ALUFELNI!! FORD FOCUS C-MAX 1.8 Ghia DIG.KLÍMA+PLÜSS+ALUFLENI!!! FORD FOCUS C-MAX 1.6 TDCi Ghia DPF BŐR+ÜLÉSFŰTÉS+TEMPOMAT! FORD FOCUS C-MAX 1.6 VCT Ghia BŐR+ÜLÉSFŰTÉS+TEMPOMAT! FORD S-MAX 2.0 TDCi Titanium Powershift NAVI+FÉLBŐR+PDC!! HONDA CIVIC 2.2 CTDi Sport GYÁRI ALUFELNI!!! HONDA CIVIC 1.7 CTDi ES SPORT ALUFELNI+AUT.KLÍMA! HONDA CR-V 2.0i ES TEMPOMAT+GYÁRI ALUFELNI! HONDA JAZZ 1.4 Elegance PANORÁMA TETŐ+DIG.KLÍMA+TOLATÓRADAR!! HONDA JAZZ 1.4 ES Sport My. 2005 BŐR+DIG.KLÍMA!!! HYUNDAI I20 1.25 Life AC BI-FUEL LPG NAVI+ALUFELNI! HYUNDAI I20 1.25 Life AC 65.000 Km!!! HYUNDAI SANTA FE 2.0 CRDi GLS Leat. 4WD (Automata) DIG.KLÍMA+BŐR!!! KIA CARENS 1.6 EX DIGITÁLIS KLÍMA!!! KIA CARNIVAL 2.9 CRDi EX (7 sz.) 7 ÜLÉS+GYÁRI ALUFELNI!!! KIA CEE'D SW 1.4 EX EURO5 2 ZÓNÁS DIG.KLÍMA!!! 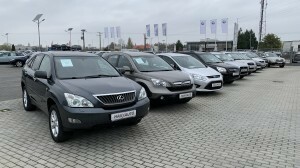 KIA SORENTO 2.5 CRDi EX BŐR+DIG.KLÍMA!!! KIA SORENTO 2.2 CRDi EX Base 4WD (Automata) NAPFÉNYTETŐ+BŐR+TOLATÓKAMERA!! KIA VENGA 1.6 EX Limited TOLATÓKAMERA+DIG.KLÍMA!! MAZDA 3 Sport 1.6 CD110 Active NAVIGÁCIÓ! MAZDA 5 1.6 CD TX Plus TEMPOMAT+DIG.KLÍMA+ALUFELNI! MAZDA 5 1.8 CE 7 ÜLÉS!! 112.000 Km!!! MERCEDES-BENZ A 200 CDI Avantgarde FÉLBŐR+TEMPOMAT+PDC!!! MERCEDES-BENZ E 280 CDI Avantgarde (Automata) EVO BŐR+XENON+TEMPOMAT!! MITSUBISHI GRANDIS 2.0 DI-D Instyle (7 személyes ) TEMPOMAT+PLÜSS+ALUFELNI!!! NISSAN MICRA 1.2 Elle DIG.KLÍMA+TEMPOMAT+ALUFELNI! NISSAN NOTE 1.4 Acenta TEMPOMAT+GYÁRI ALUFELNI!! NISSAN QASHQAI 1.6 Acenta TEMPOMAT!!! NISSAN QASHQAI+2 1.6 Acenta PANORÁMA+TEMPOMAT+DIG.KLÍMA! OPEL ASTRA H TT 1.6 Cosmo FÉLBŐR+ALUFELNI!! OPEL ASTRA H 1.6 Cosmo Easytronic FÉLBŐR+GYÁRI ALUFELNI! OPEL ASTRA H Caravan 1.7 CDTI Elegance DIG.KLÍMA+PLÜSS+FA BERAKÁS!! OPEL ASTRA J 1.7 CDTI Cosmo NAVI+FÉLBŐR+ALUFELNI+PDC!!! OPEL ASTRA J Sports Tourer 1.4 T Cosmo EURO6 FÉLBŐR+TEMPOMAT!! !